Teeth whitening is one way that we maintain ourselves publicly in the 21st century. It’s no longer categorized with the more supplementary actions of highlights and/or spray tans, but instead, exists as a totally unisex practice that looks much more like normal self-care. The desire to have nice, white teeth needs no real explanation: They’re one of the first (and most noticeable) things people see while they make their 20-second first impression of you. If you plan to speak, there’s no hiding them; less-than-perfect teeth can be interpreted as a lack of dedication to oral care or habits like heavy smoking. And lastly, and perhaps most importantly, smiling and laughing are expressions of joy most of the time, and they’re the knee-jerk reactions you really want to be able to enjoy without insecurity or second thought. But why don’t we all just have the pros do it for us? Professional teeth whitening is expensive and for many inaccessible. Plus, teeth whitening is something we do many, many times in our lives for a reason. You’re probably going to be “good” for a few weeks before forgetting to use the right toothpaste or until your habits of drinking coffee or red wine or smoking catch up to you. So, since we’re human, affordable, at-home teeth whitening products are one market that you won’t see going away anytime soon. Navigating the options, though, is something that doesn’t seem to get easier. There is a lot of interest in white teeth, so there are a lot of products out there claiming to give you what you want. But which ones work? Which ones work but actually do a ton of damage to your teeth while they work? Which ones should I avoid if I don’t want my teeth to fall out immediately after? In an ideal world, we would all have a friendly neighborhood dentist who didn’t mind our 1 p.m. calls on a Saturday because we’re at the grocery store right now and would she or he please help narrow down some options. Most dentists are not there for your supermarket quandaries, and they aren’t going to have a predetermined list to write down on your hygiene bib when you ask last-minute what his or her favorite DIY products are. Not to mention that many of us fear asking our dentists in case they sigh and give us an (understandable) plug for professional treatment that we really cannot afford. So, we asked an expert for you. Dr. Neil Hadaegh DDS, a professional dentist in Beverly Hills, was kind enough to give us his five go-to DIY teeth-whitening products, all of which you can find below accompanied by Dr. Hadaegh’s specific reasons why. [Opalescence 35% is] my personal favorite choice and the whitening gel I use. Opalescence is known for their whitening products in the dental industry. I’ve gotten amazing results using their whitening gel and typically use their whitening toothpaste to maintain the whiteness of my teeth after I get my desired shade. The only drawback is that you need custom whitening trays to use this product. It contains Carbamide Peroxide and is the first ADA accepted, syringe delivered, take-home bleaching gel that gives you dramatic results in as little as 30 minutes of use without requiring many applications. If you don’t have whitening trays and want as close to professional results as possible, the Opalescence Go 15% is the way to go. Like Crest 3D Whitestrips, the whitening gel comes in ready-made trays that adapt to your teeth all the way to your molars. They have 15% Hydrogen Peroxide, which means you only need to wear them for 15-20 minutes a day for 5-10 days. It also contains Potassium nitrate and Fluoride to help reduce sensitivity while strengthening enamel. Research has shown that the formulation of Lumibrite has resulted in little to no sensitivity while producing excellent results due to its high concentration of Carbamide Peroxide. Lumibrite requires custom bleaching trays and many of our patients use it because you get dramatic results in much less time than other whitening products. NiteWhite is a clinical-grade tooth whitening gel of 22% Carbamide Peroxide. It’s medium strength, so it’s an excellent option for individuals who have some tooth sensitivity but want a whitening gel that’s not too strong or too weak. It’s also the only take-home whitener that combines ACP (Amorphous Calcium Phosphate) with Potassium Nitrate and Fluoride enhancing whitening results while minimizing sensitivity. 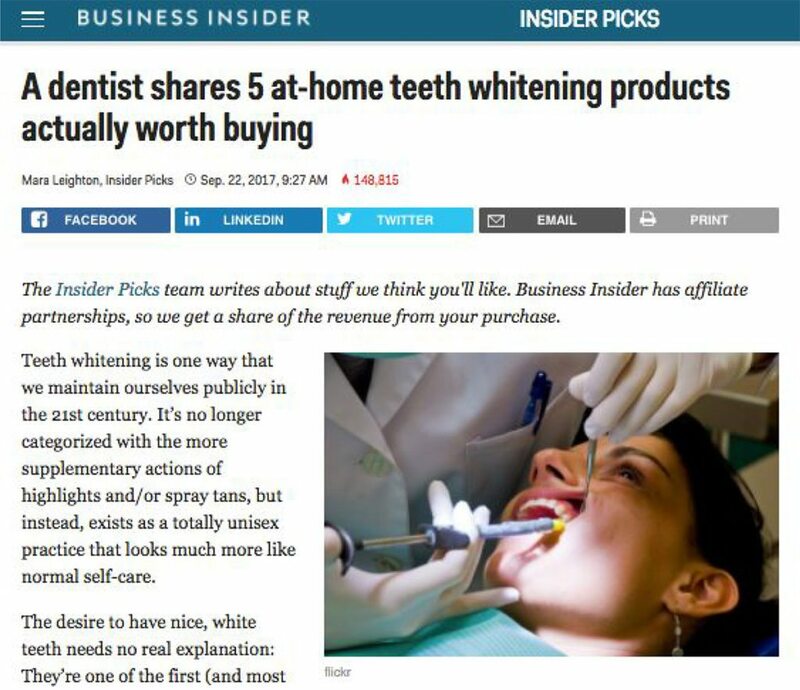 [It’s also to be used with custom whitening trays]. [Crest 3D] can be purchased in stores or online and the gel is contained in strips that mold around your teeth. They typically have a lower concentration (10%) of Hydrogen Peroxide so they’re better suited for individuals who have sensitive teeth and can’t tolerate higher concentrations. Crest 3D White Whitestrips Professional Effects Treatments, 20 count, available at Target ($43.99) and at Amazon ($41).